The history of the United States is multilingual, and many non-English speaking communities have managed to maintain their languages, sometimes for hundreds of years. 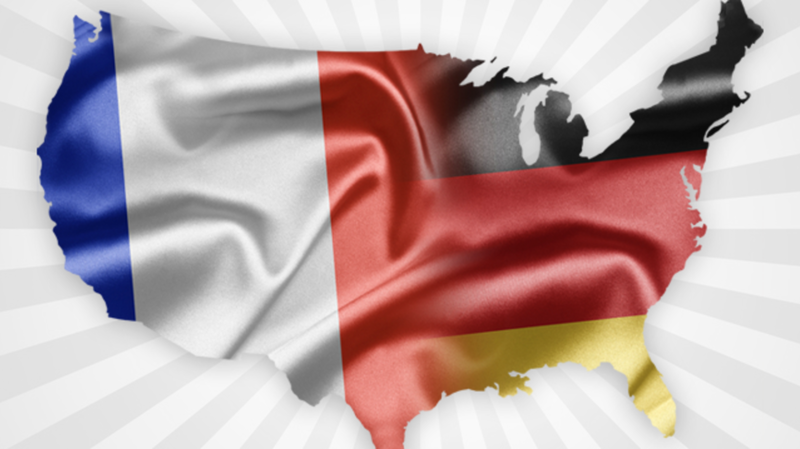 Here are six dialects of French and German that go back a long way. French has been spoken in Louisiana since long before the Pilgrims arrived. Here, in a clip from YouTube travel channel Where's Andrew, Louisiana native Elgin Thibodeaux explains how his whole family still speaks French. What we call Pennsylvania Dutch is actually an old dialect (or collection of dialects) of German that has been here since colonial times. It's still spoken in many parts of Pennsylvania and a few areas of Ohio and Indiana. You can hear its difference from standard German in this collection of examples of people counting from one to 10. Less well known than Louisiana French is New England French. It was brought through French Canada to an area running from Maine to Connecticut, and survives in very small numbers of speakers these days. Some young people are trying to keep it alive. Here 17-year-old Christian, from Berlin, New Hampshire, contributes an example of the dialect to Wikitongues, a non-profit organization that aims to create a public archive of the world's languages. The U.S. received a huge influx of German immigrants in the 19th century. Some of the communities they established maintained a nearly completely German-speaking way of life for a few generations. Here is Vernell, from Fredericksburg, Texas, talking about her Texas German upbringing. Also known as paw-paw French, this language spoken by settlers in Ozark mining communities for centuries is nearly extinct. Here is a recording of Missouri French folk tales collected by scholar Joseph-Médard Carrière, read by Chris Valdivieso. Many German-speaking immigrant communities maintained their language for generations in Wisconsin. The settlers of New Glarus, Wisconsin came from Switzerland, and the German of their descendants is specifically Swiss. You can hear an example of it from the University of Wisconsin's Max Kade Institute for German-American Studies here.